The newest addition to Southeast Missouri State University’s (SEMO) River Campus, the Ken and Jeanine Dobbins River Campus Center functions with dual purpose: a residence hall for both new and returning students and a visual and performing arts learning center associated with the Holland School of Visual and Performing Arts. All classroom spaces are located on the first floor within close proximity to each other and to the residence hall dormitories above. The dance, music and theater classrooms each have unique acoustical requirements in order to function well for both students and instructor. 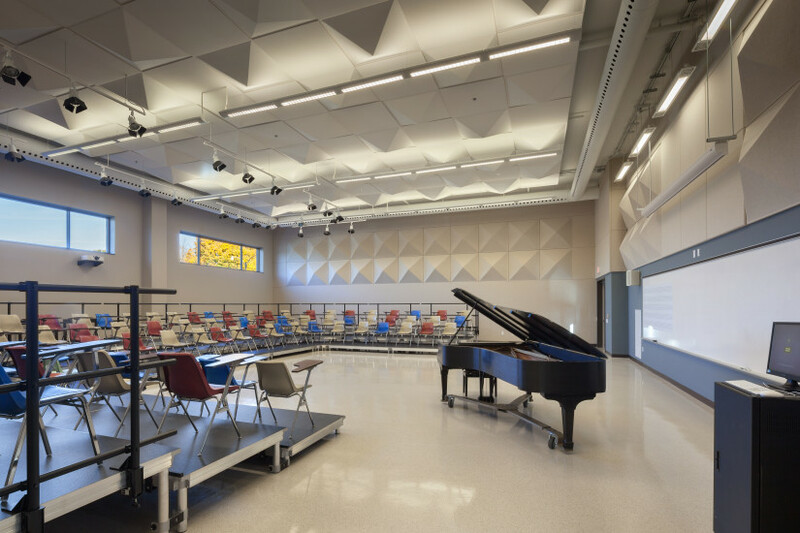 These building features created a number of acoustical challenges. Coordinating with SEMO and the design team, Shen Milsom & Wilke integrated acoustical solutions into the design. Our recommendations maintained adequate sound isolation between the individual classrooms and the dormitories above. We deployed strategic sound absorptive and sound diffusive materials, and we implemented noise and vibration control treatments for heating, ventilation and air conditioning systems, creating low ambient noise levels.